So, I hope everyone has had a chance to cast on their first mitten! If not, no worries as there is no official deadline for this KAL (discount ends in November, so hurry). These mittens look like they take a lot of work & time, but in reality, once you get used to the chart & pattern they fly off of your needles. I cast on my mitten almost a week ago and have worked on it for a couple of hours here and there. It is my new car project (only for when I’m a passenger…I promise) and have already made it up to placing the thumb sts on scrap yarn! The cuff set up and getting used to moving your marker every other round is a challenge, but once you get passed the cuff and in a few rows you will relax tremendously. I have posted detailed notes for each portion of the mitten as I work them. Please post on Ravelry or email me if you get stuck. Notes can be found here. Also, I would love to see project updates & photos!! 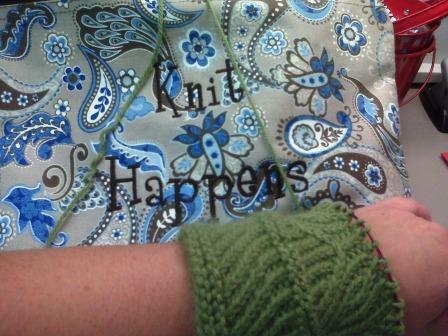 Ps- I met so many awesome knitters on the Yarn Hop this year! You do not have be a Guild member to participate in our Knit-a-Longs and to receive the discount!!! Previous Previous post: October Meeting Recap! Next Next post: November Guild Meeting!